The study of Event Related Potentials (ERPs) begins with the measurement of brain waves using equipment which records electroencephalogram (EEG) activity. 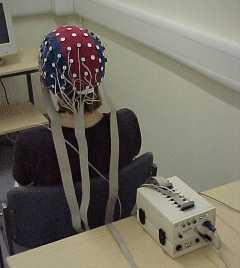 The EEG recordings of interest are those which follow the presentation of a stimulus. In our lab, stimuli are presented to participants via computer monitors. We use the BioSemi Active Two system to record EEG (electroencephalograph) activity. For more details on the Active Two system, please see the Biosemi product page. Our caps have 66 electrodes attached. We also have 6 additional electrodes which are connected to the mastoid and ocular regions on the head and two fingers of one hand. The latter measures galvanic skin response (GSR). The Active Two system uses active electrodes, where each electrode has a small amplifier attached to it, meaning we are able to use conductive gel in the recording of the EEG signals. We also use an EyeLink eye tracking system to ensure participant fixations occur in exactly the right place on each stimulus. An added benefit from use of an eye tracker comes from the use of a chin rest, as this helps stabilize the participant's head. Co-recording of EEG and eye tracking information allow us to add an important aspect to our research results. The ERP analysis approach involves averaging of recordings from many trials for a specific stimulus to determine what occurred for that stimulus. These averaged wave patterns may then be compared for multiple stimuli, to determine whether the participant reacted differently in each situation. Success in ERP analysis comes from understanding the various components of an ERP wave form. In this example, taken from Itier & Taylor (2002), the N170 is highlighted as part of their face recognition research. Most experiments focus on a particular component or those within a certain time range, such as the early components shown here. This focus allows the researcher to build on previous research which has determined how the brain reacts to certain types of stimuli and the ordering of presentation of those stimuli. Our research focus is on the temporal activity in the brain. To do more, such as determining the location of activity, is not a strength of the ERP analysis method for a number of reasons, most important of which is the challenge of determining how many and which sources generated the scalp level result. Simply put, there are often many source combinations which could result in what was recorded by the EEG system.